When securing your possessions from prying hands is one of your primary reasons for buying a safe, a biometric safe is a great choice. This type of safe uses biometric technology—fingerprint or hand scans, facial scans, iris scans, voice recognition, or so on. Fingerprint scanners are by far the most popular option. Before we get into those features in-depth, have a quick look at our product comparison chart below. Not all biometric safes are equal, though. While biometric fingerprint locks work great, if you purchase an inferior safe which has other security vulnerabilities, even a child will be able to break into it using a paperclip or a screwdriver. For that reason, it is essential to consider every aspect of the biometric safe you are thinking of purchasing. You need a strong safe which relies on more than its biometric lock to keep your possessions safe and secure. We have searched high and low online to find the best biometric safes for sale. 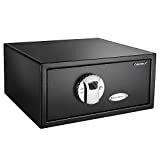 All of these safes are popular and highly rated by buyers. Their features are excellent, their prices are competitive, and they are manufactured by companies with top-shelf customer service. Which biometric safe is right for you? That depends on what you plan on storing in your safe, and why. You would not necessarily want the same set of features to store a gun collection as you would for a quick-access, self-defense handgun safe. What Should You Know About Biometric Technology? The whole principle behind biometric safes is simple. An intruder could get hold of your gun safe combination somehow, but they will not have an easy time getting a hold of you. The biometric lock will only open for your fingerprint or for another authorized user (many of these locks can hold dozens of fingerprint profiles). It will not open for an intruder or for your child. As another plus, you do not have to remember the combination. Those are all pluses, but there are some negatives associated with biometrics as well. The technology is still in its infancy, so there are no UL standards specifically for biometric sensors. Another limitation is this. What happens if you cut your finger or burn it while fighting an intruder? Suddenly you cannot get into your gun safe. Economy: Cheap gun safes (in the ~$100 price range) feature low-quality sensors. Commercial quality: The keypads alone cost $750-$1,000. These systems offer higher reliability and accuracy. Military grade: These cost $5,000 and up for the sensor alone. Usually these systems use iris scans. You probably don’t need one of these for home use! It can be worth it to pay a little extra for a higher-quality biometric gun safe. Why? The really cheap economy sensors have a “false acceptance rate.” In short, they will sometimes open even without an exact match. Even if you will be the only user, consider buying a biometric safe that will store multiple profiles? Why? You can capture your fingerprint from slightly different angles. This makes it easier to get into your safe in a hurry or a panic. While it is possible to compromise biometric safe locks, it takes quite some doing. The majority of robbers are not going to take this time or effort. Unless you are being specifically targeted for some reason, the lock should deter the majority of intruders. Consider purchasing a safe that includes a backup combination or key lock, but make sure that the quality of the backup lock is high! Otherwise someone else can just bypass the biometric system and break in through the cheaper lock. Never be afraid to spend extra to get a high-quality biometric safe from a trusted brand. Whether or not you should buy a safe with a biometric lock largely depends on what you will find convenient. Just remember that not all biometric safes are designed with the same level of structural integrity, reliability, or accuracy. Start with the products in our comparison chart, and you will be on your way to purchasing a sturdy, secure safe.